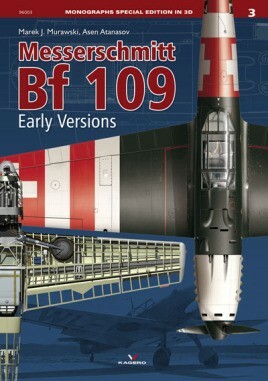 The monograph devoted to the early versions of the Messerschmitt Bf 109, the most famous WW2 German fighter, discusses its origins and development with coverage of changes made in its first prototypes, A-D variants and their sub-variants. This is an excellent combination of history, archive photos and modern computer generated imagery that I find a really delightful mixture and a pleasure to read through as well as having some first class modelling references at hand on the bookshelf, all in the one book. ‘As always with Kagero's titles, the layout, artwork and texts is first rate, with plenty to recommend it. The photos are of great interest from a historical point of view, with many showing maintenance situations, and more candid photos of aircrew and ground crew, as well as the test pilots and technicians. A very thorough book at a reasonable price, and I'm looking forward to seeing the next volume.